Leicester City moved closer to winning the Championship title as QPR missed the chance to seal a play-off place. David Nugent scored the only goal, firing past keeper Rob Green from 12 yards, before QPR defender Benoit Assou-Ekotto received a second booking. QPR had several chances with Yun Suk-Young and Niko Kranjcar forcing decent saves from Kasper Schmeichel. At the other end Andy King had an effort cleared off the line and earlier fired at Green from close range. The result sees Leicester move onto 93 points with Nigel Pearson's side holding a seven-point advantage over Burnley with three games left. QPR remain fourth but need just a point to seal a play off place. Harry Redknapp's side had the better of the early chances with Yun and Kranjcar forcing routine saves from Schmeichel. Kranjcar then saw his close-range effort blocked by the legs of Schmeichel after a goal-mouth scramble before Leicester cleared their lines. At the other end King had two chances in quick succession to give the hosts the lead. First he fired a half volley from six yards straight at Green and then, having rounded the QPR keeper, he saw Nedum Onuoha brilliantly clear his effort off the line. QPR continued to create chances themselves and Modibo Maiga was unlucky to see his effort deflect off Wes Morgan and sail just wide after he had been played in by Kranjcar. But Leicester eventually broke the deadlock with Nugent scoring his 19th league goal of the season. The Foxes forward was played in by Daniel Drinkwater and, after outpacing the QPR defence, he fired across Green and into the far corner of the net for 1-0. QPR'S task was made that much harder when Assou-Ekotto was sent off for a second bookable offence. But they pressed for the equaliser and Kranjcar's free-kick was deflected wide as Leicester held on for another three points. Leicester manager Nigel Pearson: "We deserved to win the game and we created more opportunities. "We are in a good position and I thought this was a very interesting and tactical game between two good sides. But I have not changed my philosophy, we have three games left and we want to win them all. "I think QPR have a lot of quality players and showed their depth of quality. It was always going to be a tough game for us to win and both games against QPR have been decided by one goal and fittingly each time it was a quality goal." QPR boss Harry Redknapp: "We still need another result. We are still one result away from doing it - although you never know, do you? We might not have to win another game. "We might have enough points already, but we don't want to leave that to chance so we are looking for another win. "I thought we played well and were unfortunate to lose. They are a good side but I thought we were every bit as good as them." Match ends, Leicester City 1, Queens Park Rangers 0. Second Half ends, Leicester City 1, Queens Park Rangers 0. Danny Simpson (Queens Park Rangers) wins a free kick in the defensive half. Corner, Leicester City. Conceded by Robert Green. Attempt saved. Riyad Mahrez (Leicester City) right footed shot from the right side of the box is saved in the bottom right corner. Assisted by David Nugent. Attempt blocked. Bobby Zamora (Queens Park Rangers) left footed shot from outside the box is blocked. Assisted by Gary O'Neil. Attempt blocked. Ravel Morrison (Queens Park Rangers) right footed shot from outside the box is blocked. Assisted by Bobby Zamora. Hand ball by Ravel Morrison (Queens Park Rangers). Attempt missed. Riyad Mahrez (Leicester City) left footed shot from outside the box is high and wide to the left. Assisted by Daniel Drinkwater. Attempt blocked. Daniel Drinkwater (Leicester City) right footed shot from outside the box is blocked. Assisted by David Nugent. Substitution, Queens Park Rangers. Ravel Morrison replaces Niko Kranjcar. Attempt missed. Matthew James (Leicester City) right footed shot from outside the box is close, but misses to the left. Assisted by Daniel Drinkwater. Attempt missed. Daniel Drinkwater (Leicester City) left footed shot from outside the box is too high following a set piece situation. Second yellow card to Benoit Assou-Ekotto (Queens Park Rangers) for a bad foul. Substitution, Leicester City. Liam Moore replaces Jeffrey Schlupp because of an injury. Delay in match Jeffrey Schlupp (Leicester City) because of an injury. Corner, Queens Park Rangers. Conceded by Ritchie de Laet. Kasper Schmeichel (Leicester City) is shown the yellow card for a bad foul. Foul by Kasper Schmeichel (Leicester City). Yun Suk-Young (Queens Park Rangers) wins a free kick in the attacking half. Substitution, Queens Park Rangers. Bobby Zamora replaces Modibo Maiga. Offside, Queens Park Rangers. Niko Kranjcar tries a through ball, but Shaun Wright-Phillips is caught offside. Goal! 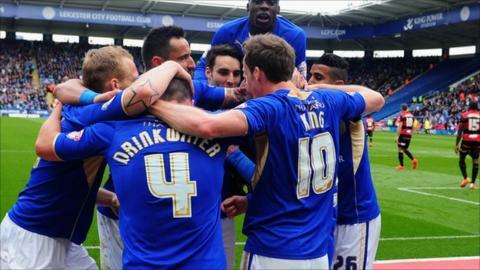 Leicester City 1, Queens Park Rangers 0. David Nugent (Leicester City) right footed shot from the right side of the box to the bottom left corner. Assisted by Daniel Drinkwater. Corner, Queens Park Rangers. Conceded by Marcin Wasilewski. Attempt blocked. Niko Kranjcar (Queens Park Rangers) left footed shot from outside the box is blocked. Assisted by Modibo Maiga. Niko Kranjcar (Queens Park Rangers) wins a free kick in the defensive half. Offside, Leicester City. Daniel Drinkwater tries a through ball, but David Nugent is caught offside. Attempt missed. Modibo Maiga (Queens Park Rangers) left footed shot from the right side of the box is close, but misses to the left. Assisted by Niko Kranjcar.